Grain-free, keto crispy waffles made entirely of ground flaxseed. No flour, no grains, no sugar, just flax, and it’s completely keto! 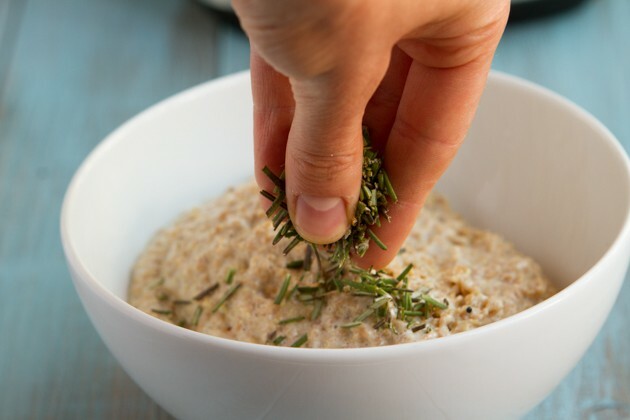 Infused with fresh herbs or ground cinnamon – dress it up sweet or savory. When I travel and have access to a kitchen, I bring a couple of bags of pre-made Keto Grain-Free Flaxseed Focaccia mix with me. All of the dry ingredients that the keto recipe calls for in little ziploc bags. When I get to my destination and want to make a batch, I add water, oil and eggs and away I go! 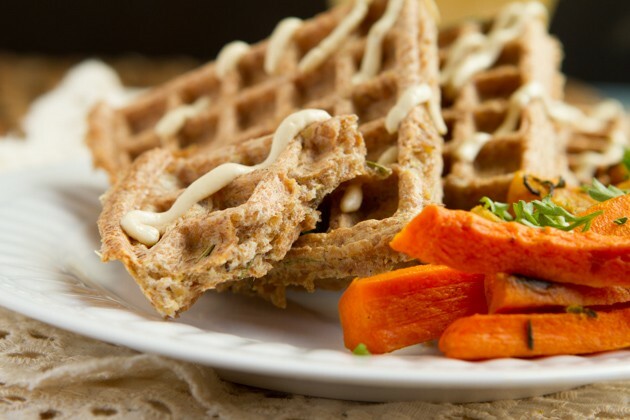 The other day, my sister and I came across one of the bags in the pantry while we were making keto waffles and we thought maybe, just maybe the mixture would make the perfect savory keto waffle. We added water, oil and eggs, a bunch of chopped fresh herbs and scooped it onto our favorite waffle maker. Low and behold, the waffle maker beeped, we opened the top and feasted our eyes on the keto beauty. It was like nothing we’d ever experienced. Crisp and golden, perfectly cooked all the way through. No gumminess. It was keto waffle perfection. Seriously, Keto Grain-Free Flaxseed Focaccia never disappoints. 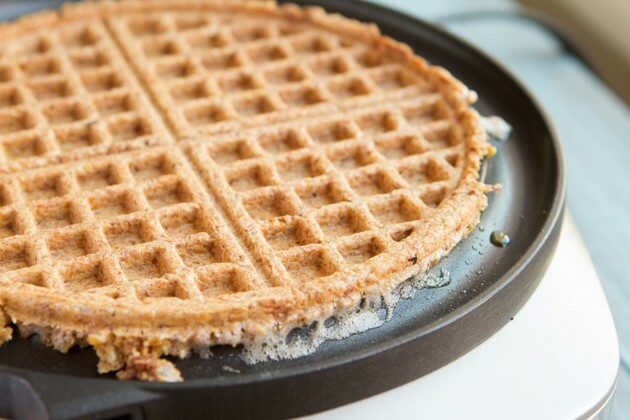 Keto breads, keto muffins, now keto waffles? It’s a keto dream come true. Concerned with what flax does to hormone levels? Make it egg-free/vegan. 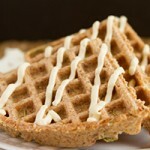 Check the notes section of the keto recipe on how to make these grain-free, keto waffles egg-free and vegan. Make it savory. Add fresh herbs into the keto batter. When complete, top with roasted veggies, shredded chicken, sliced brisket, avocado, mayo, mustard, or sauteed onions. Think: keto waffle sandwich. Make it sweet. Fold in ground cinnamon to the keto batter. When complete, top with your favorite low-carb fruits like strawberries, raspberries or blueberries. 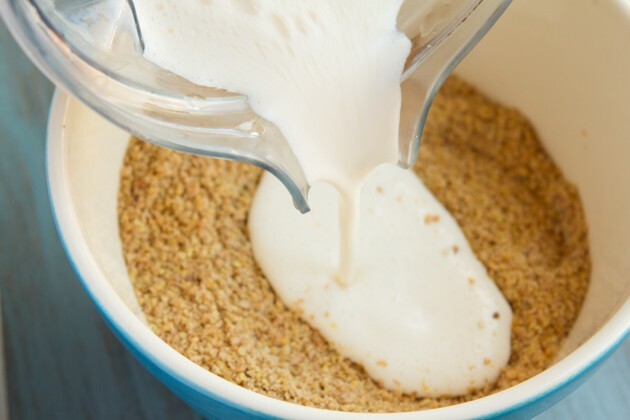 Add a dollop of keto coconut cream. 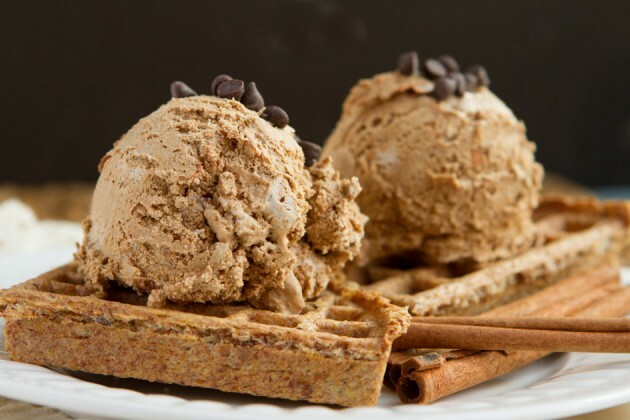 … you could even make a batch of these grain-free, keto waffles with ground cinnamon and top with my Keto Fat Bomb Ice Cream (dairy-free + sugar-free). 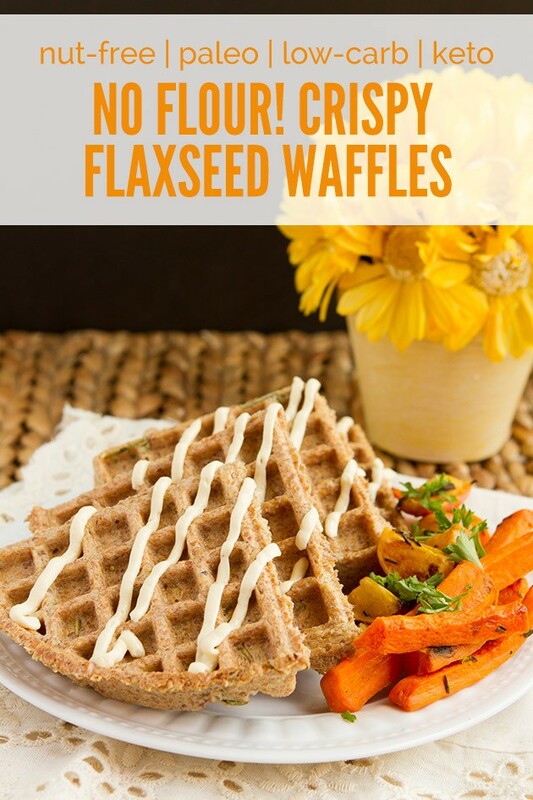 Grain-free, keto crispy waffles made entirely of ground flaxseed. Infused with fresh herbs or ground cinnamon. Dress it up sweet or savory. Gluten-free, grain-free, paleo, vegan + keto. 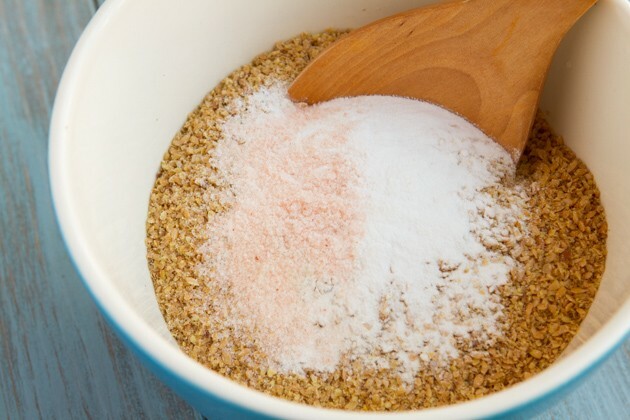 Add all of the dry ingredients to a bowl and give it a little stir. Set aside. 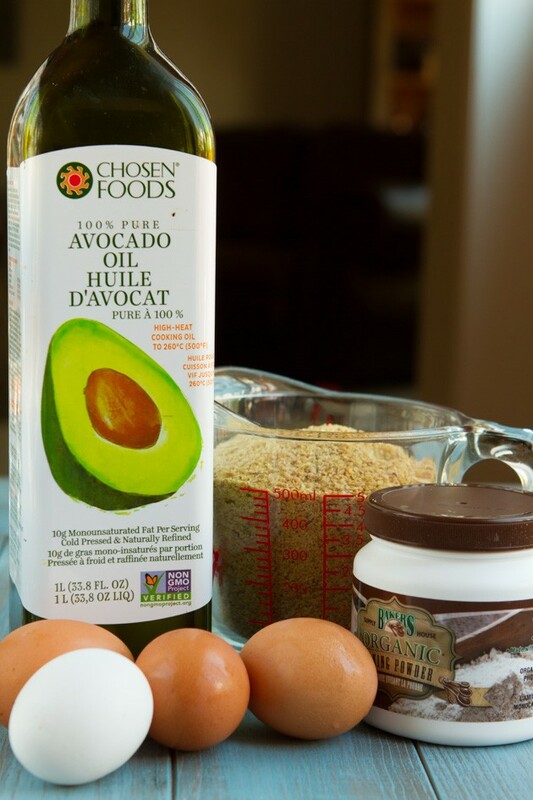 Add the wet ingredients to your blender (it must be a blender or this keto recipe will not work). 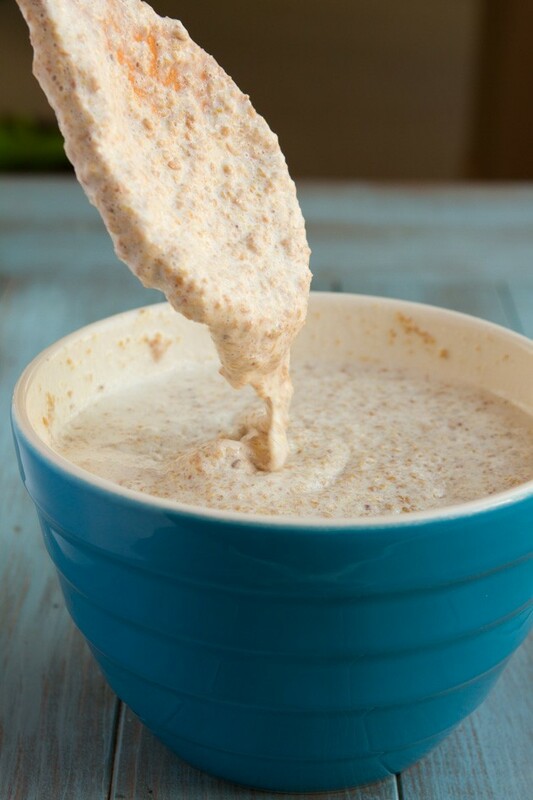 Once it’s foamy, add it to the bowl of dry ingredients. Stir and let sit for a little while to firm up. Have faith. You can see, it gets thicker and thicker. This is just a couple of minutes in. Add in your fresh herbs, if you’re doing it. Or stir in some ground cinnamon. Better yet, you could separate the dough and do a different flavor for each keto waffle! Drop the batter onto your preheated waffle maker. Close the lid, lock it up, and let it cook. My favorite setting is “5” – it makes the keto waffles nice and crisp and perfect! 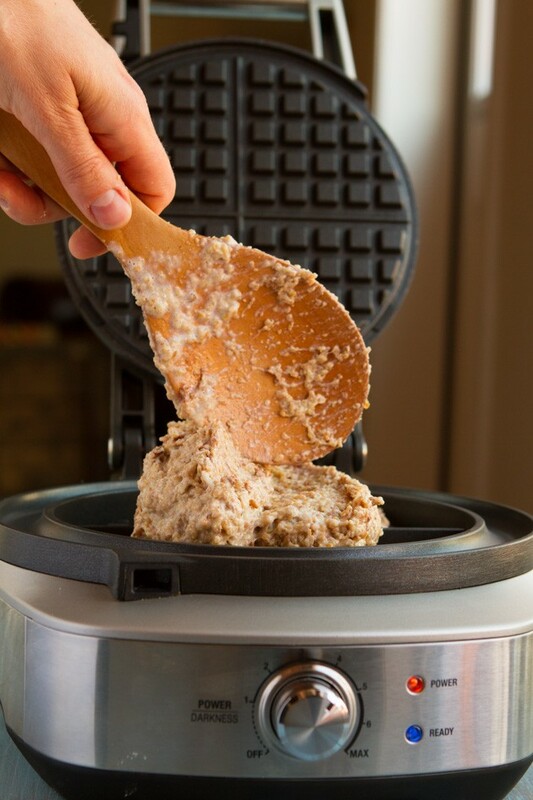 Once your waffle maker beeps, lift the lid and use a fork to remove the keto waffle from the waffle maker. Place on a cooling rack and repeat with remaining keto batter.